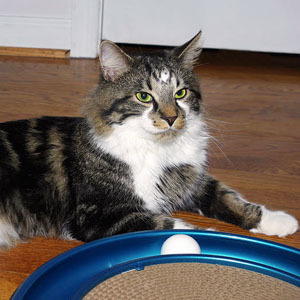 CLARK GABLE (aka Whiskers, aka BeBe) is a VERY handsome fluffy boy who we decided was a "lady's man." That's why we named him Clark Gable. The most notable thing about him, however, other than his handsome good looks, are his huge whiskers! So, we started calling him "Whiskers." His foster mom calls him "BeBe" – short for "baby" so this is the name he responds to. This lover boy wraps his arms around your neck and purrs in your ear. He is a young, energetic male who enjoys interactive play especially with the Da Bird flying toy and balls to bat back and forth to you. He loves and wants human attention – following you throughout your home, running up and down the stairs and sleeping in your arms every night. 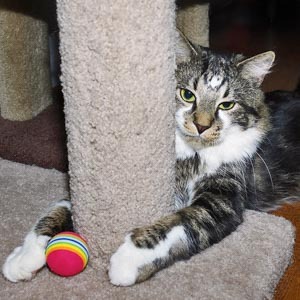 While Whiskers is an amazingly loving cat, he is going to be very shy in a new home initially. 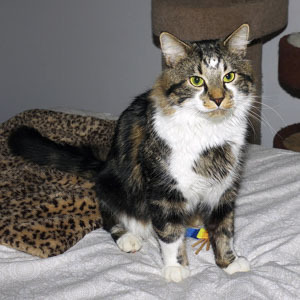 He needs a patient and experienced cat guardian who understands he will need a couple of weeks to adjust. He also gets along fine with the other cats in his foster home. He would be happy with the right other kitty companion in his forever home. Or he could be an only kitty as long as his caretakers give him lots of affection, interactive play and a window to watch the birds outdoors. Whiskers is a TRUE rescue story. He was heard crying for days in a thicket of bamboo, until one of our long-time volunteers was able to coax him to trust her after several days of feeding and talking to him. At first he was scared indoors, but he slowly adjusted to his foster mom then to others in the household. 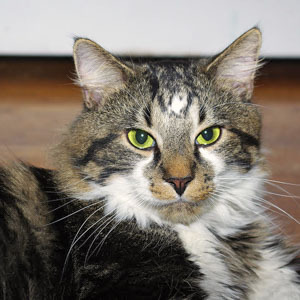 If you are looking for a handsome cat that runs to greet you, lets you pick him up and pet him, snuggle him, brush him, clip his claws…you name it, Whiskers will be pudding in her arms. It may take him a little while to transition to a new home and new people, but give him a little time and he will be your best buddy.